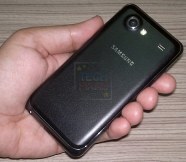 We have the first live pictures of the recently announced Samsung Galaxy S Advance, along with details on the expected price and release date. The price will be 22,990 Philippine pesos, which amounts to around $535 and the Galaxy S Advance is expected to be first seen at the MWC later this month and should become available in the Philippines, at least, around the same time. 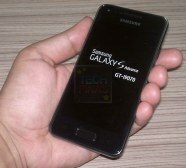 On the hardware side of things the Galaxy S Advance looks like a cross-pollination of the Galaxy S and the Galaxy S II. The curved screen does set it apart, though at 9.7 mm thick it is more an S than an S II. The specs are already well known but just in case you've missed them - the Advance has a curved Gorilla Glass 4" Super AMOLED display of WVGA (480 x 800), a dual-core 1 GHz Cortex-A9 processor, a 5 MP snapper on the back with 720p video recording abilities and, upon launch at least, Android Gingerbread 2.3.6.
this will be out last week of April, for a price of 21,000 it's worth it with the specs..